As it’s a bank holiday in the UK, I thought I’d do a quick post. 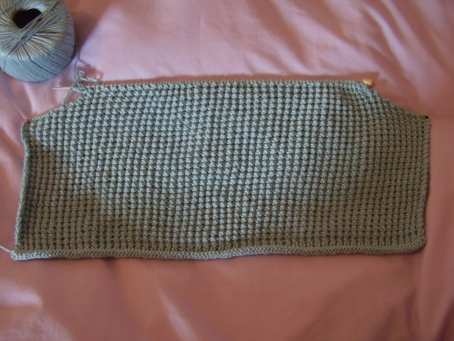 Typically it’s been raining on and off all day so I’ve spent a very pleasant day knitting and have done another 3 inches – I’ve almost finished the back, hurrah! 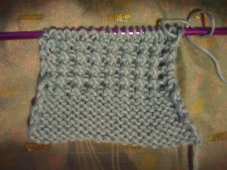 While I knit I like to watch tv – and today it was an episode of Shark (US lawyer drama) and one of The Last Detective (UK detective drama) it can’t be anything I really love to watch I don’t concentrate very well when I’m knitting. Yesterday I was reading Annarella’s blog and she mentioned listening to Pixie Purls Podcasts while knitting so I thought I’d try it and today I’ve listened to two podcasts from last summer and I really liked it. Although I was a bit jealous that she goes to a knitting group every Saturday because I wish there was one where I live. I’ve downloaded 10 Pixie Purls Podcasts so that should keep me occupied for awhile. Well one week on and I’ve got this far. I’ve done the shaping at the bottom of the armholes and am now knitting straight up for a bit…. 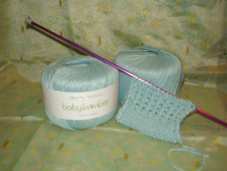 I like the yarn, it’s lovely to knit with and feels really soft and the pattern is easy but not boring. Spent the day in Bath yesterday with a dear friend and had a very nice day. I treated us to lunch in Sally Lunn’s Tea Shop. We each had a toasted sandwich made with a Sally Lunn bun and I had a pot of Sally Lunn blended tea and ‘in the words of Dr. Johnson, it is a tea which “amuses the evening, solaces the midnight and welcomes the morning.’ or so it said on the menu. It was a nice change as I don’t drink tea very much anymore. Later on we stopped shopping for coffee and a brownie, heavenly. All in all a really good day. I went to Wells in Somerset today, mainly because I’d heard about an amazing wool shop called Mandy Wools there. And it lived up to the hype! It’s a big L shape about 3 times the size of any wool shop I’ve been in and they were extremely helpful even when I was being completely indecisive. I bought some mixed buttons from a charity box, some multicoloured ones to replace some that the paint is peeling on a black top and 8 balls of Sirdar Snuggly Baby Bamboo so that I can knit myself a short jumper. I couldn’t find a pattern in the shop and believe me we DID look so I’ve settled on this one from Simply Knitting a couple of months ago called Tequila Sunrise. I was originally going to make it in stocking stitch but now as I’ve tried the pattern out I think I might go for that and it’ll make knitting it a bit more interesting. Wells itself is very pretty, has a good selection of shops (in one I got a reversible recycled wrap around skirt for £8.50!) 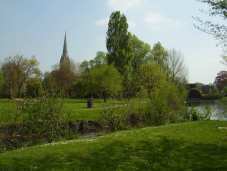 for a small town, a lovely cathedral and a very good market. It was definitely worth the trip! I finished my lacy socks on Thursday and then wore them out last night to see some friends I haven’t seen altogether since October. It was lovely to see everyone and we had a lovely evening with lots of lovely food, including a wonderful chocolate meringue with cream and raspberries that is “to die for” (recipe and picture here) and I’m not exaggerating. My socks were a success and were commented on, they are supposed to have a ribbon threaded around the top under the rib and then tied and I think that would help keep them up but they did only need pulling up twice so that’s much better than when I wore knee socks to school!! I have a ball and a half of the Elle Stretch DK left so I may have to buy some more in a contrasting colour and knit some more stripy socks with it. I love that it’s stretchy!! So yet again I don’t have anything on the needles and am feeling lost. NOTE TO SELF: I must remember to have something ready to go when I get near the end of the next project. 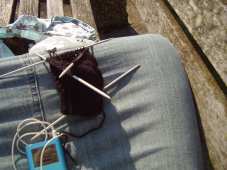 These are some of the pictures I took on my knitting in the park afternoon. 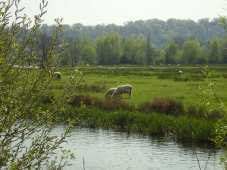 It was a lovely day and made very entertaining by the mad sheep swimming across the river from the sheep meadow to the public park. 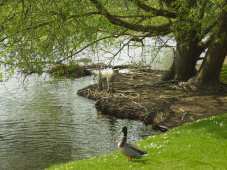 It was then chased by a dog back into the river and then somehow managed to get back out of the river on the other side. I haven’t made much progress on my socks but as it’s a long weekend I’m sure I’ll get down to the second heel soon. I’m reading The Prestige by Christopher Priest because I watched the film last night and it’s really good, I watched it twice because it’s one of those films that after you’ve seen the end you feel like you need to watch it again. The book is quite different from the film but very good still.